I did a crude calculation the other day which suggested that a huge chunk of the development which occurred along the M50 (Citywest, etc.) not to mention hundreds of low-rise apartment buildings in places like Chapelizod could have been accommodated in the area which was redeveloped as part of the Dublin Dockland scheme. The opportunity was missed. And this is one big reason why Dublin is in the mess its now in. Briefly, the Dublin Dockland Development Authority was set up in 1997 by Act of Parliament and given the task of drawing up a master plan for the regeneration of practically the whole east end of Dublin which, at that time, was in various states of dereliction. Soon after, the DDDA published a series of plans for how distinct areas within its control should be redeveloped. It would be fair to characterize these plans as proposing a ‘grid iron’ system of streets with (not too clear) guidelines showing a preference for generally low rise buildings. It’s too low rise. Viewed from the city centre, the thin ribbon of buildings stretching along the river toward the sea has no great visual impact. Being too low also means that, no matter how much density the DDDA says it’s achieving, it’s not nearly dense enough for the heart of downtown. We could have taken so much development pressure off the areas on the outskirts of Dublin if we’d provided good quality apartment accommodation along the rive. And I know the idea is to eventually dot the dockland skyline with some carefully spaced out for aesthetic reasons tall buildings, but I don’t buy that approach. They’ve done it in London and, for all their efforts, I still think it looks like Cincinnati. People understand tall buildings when they’re there for a reason. A clump of skyscrapers in the heart of downtown makes absolute sense – density, activity. Building skyscrapers for aesthetic effect doesn’t work. The use mix isn’t right. Although there are some buildings in the new dockland area which have a mix of retail-on-the-ground-floor/residential-above, there are several very prominent single use, corporatey type things which take up, and strangle the life out of, entire blocks. They make the place feel like a suburban business park in the city by the sea. The new areas are not successfully integrated with the surrounding neighbourhoods. The area around the Grand Canal feels like a walled town landed on the edge of Ringsend. There’s no public transport. I know that Metro and Luas lines are proposed for the area, but they won’t be in place for the best part of ten years. 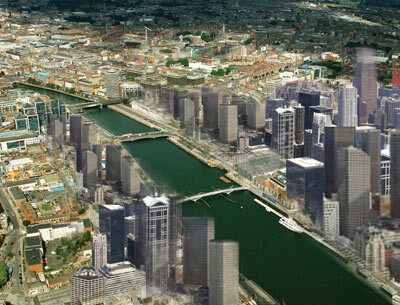 In the meantime, the Docklands will remain isolated from the rest of the city. When the new rail links are in place, I’m pretty sure there’ll be some major redevelopment and the Docklands will end up looking a whole lot different than it does right now. Just one last thing on the Docklands. I don’t think people are generally aware of the fact that it has a different planning system than the rest of us have to endure. What happens is, you lodge the planning application with the DDDA (not Dublin City Council) and if the Authority says the proposal meets the local plan guidelines, no objections. Why can’t the rest of us have that?